Denny Jump (Bellevue, WA, United States) on 22 August 2012 in Abstract & Conceptual. I just wanted to say to everyone how sorry I am for not responding to your wonderful comments and not commenting on your great images. Although I have found a little time, here and there, to post images, I have not been able to garner sufficient time to do what I like to do best - which is to view YOUR work and add my "2 cents" to the commentary. Hopefully this situation will clear up soon, but please know that I REALLY appreciate everyone's kindness and great remarks to me. As soon as I can I will spend more time with everyone's blogsite because I truly love to view your work and "share the love" by conversing with all of you. But, for now, this scene pretty much depicts my status: A wreck, tangled up in weeds. @ursulakatariina: It rather does shout summer with all of those Queens Lace flowers around - Thank you very much, Ursulakatariina! Thats the most beautiful wreck I've ever seen :) ...and it really does say summer...lovely compo! @Doug: Hi DOug - Thank you very much for your always kind and supportive comments - much appreciated. It may be all tangled up, but you have made a great composition from a difficult scene....I know you will do the same in your life! Hope you are "Hanging in There" my friend...When things get tough around our house we like to quote the wise Dory from Finding Nemo "Just Keep Swimming!" @Tracy: With all the experience I have had painting over the years - I use a variation of your term by telling myself - Just Keep Painting :-) Thanks Tracy...I thought you were headed back west by now. A nicely sunlit shot of something I see quite a lot in Toronto, which is the bike corpse capital of the world it seems. You're such a nice guy; don't worry about time management on Am3 if you just don't have it to manage, buddy ;-) ~ we'll be blessed by your commentary and visits when you can fit them in, but I hope things ease up on you schedule wise ! @Rick: Thanks Rick - I really appreciate your kind words...YOU are the nice guy though! @Judy aka L@dybug: Hi Judy - Thanks so very much. They are Queens Lace, I believe - they belong to what I call the Floweed" category...Sopme call them weeds, some call them wildflower...although they grow like weeds around here in the summer, I still look upon them as wildflowers....Thanks so much! Great find ... the beautiful light and flowers add so much charm! Fantastic shot ... love it! Wonderful image! 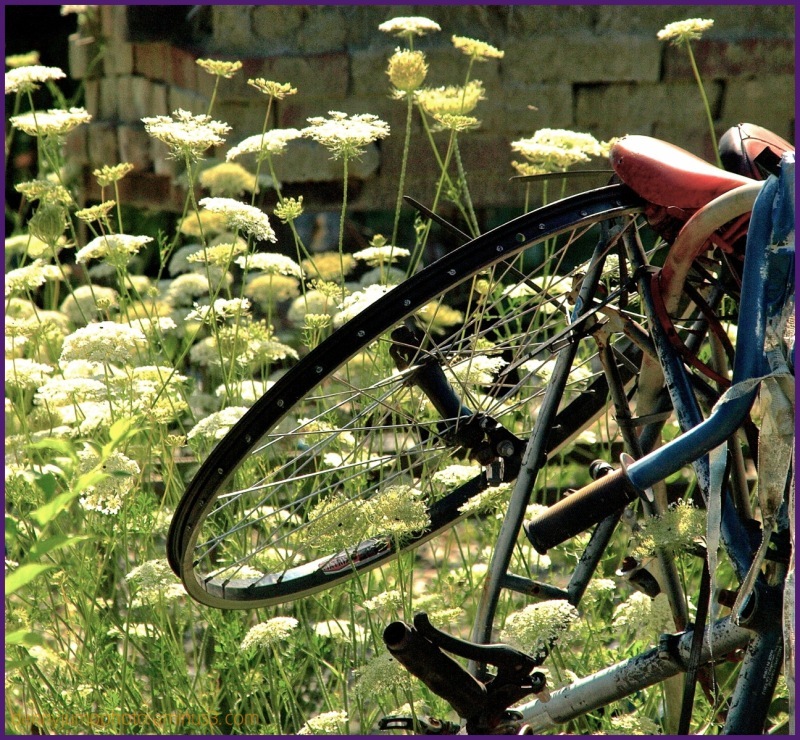 I like the contrast of the flowers and the old bike. You sound overwhelmed. I hope you are doing all right. Nice image - agree with others - nice contrasts here! A cool shot of the bike and pretty weeds. time - and nature - heal all wounds, they say ... what a poetic image, denny! Denny, what a fabulously evocative photo. It is just stupendous! Denny Jump, you should get an award. The greatest commenter on Aminus3 award. Your kindness is just so lovely and a friendship that Christine and I value very much. I write this while watching a programme on Prog Rock on the BBC. . . You'd love it! Nice composition. This picture manages to tell a story as well as record a scene. Well done.